I’m at my daughter piano Recital. It is going well, and she is playing reasonable well; well poised and reasonably accurate (perhaps especially when considering her practice…) when it strikes me. 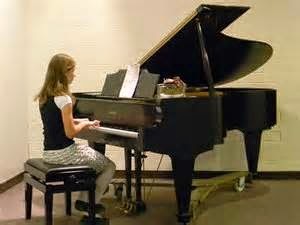 A piano recital is a really excellent analogy to chess, and as a sit there watching all these young improving piano students; I’m thinking about all the long hours you don’t see where each pianist has strained and struggled to master his scale, and get the fingers playing the right notes at the right times…. Chess is much like that! Where one player looses the thread to a horrible blowout; another triumphs in a masterly blowout. Our practice, and persistence are all tested in this regard. We know, generally, the “winning way” when it comes to chess. You play a opening your comfortable with; and accrue some kind of middlegame chances. Then either you find powerful tactical combination or find some of hopeful grinding endgame; that tips you towards victory. But just knowing how the music is suppose to sound is not enough!... In slow serious games you see what you’ve become. I’m NOT do a lot of tournaments, but I’m playing in the slow chess league and getting more serious with 45 45 games. Anways, a great game MIGHT not be as easy to appreciate, and not as obvious to untrained ears. But in the war of moves; legitimate skill cannot be faked. I hope that I, as well am gaining some of my daughters form ; and working towards more impressive performances. ANYWAYS, as my slump eases, these days, chess analogies seem everywhere. Church sermons, work banter, even dreams! Is this a sign that I’m spending an epic amount of time thinking of chess? I said before that I was struggling with blunders More and especially in my last effort to improve my blitz game. I’ve been working through my games and its true! Blundering has picked up, and it begs the question, WHY? I think I’ve finally found an answer to that question. During my last “slump”; tactics puzzle took a big hit- as I was determined not to drop any of my “turn-based” games at chess.com. What I noticed with the blitz is that- I was missing tactical chances. If you want to give a lower rated player a lot of chances; aimlessly wander your pieces around a lot and sooner of later; some golden opportunity will percolate through their head. Moreover, and just beyond that, I’ve always had tendency to blunder quite a lot. Miscounting, very easy tactics and hanging things. Its just that , head all full of recent tactics- many players are a bit aimless- and my game sharpens up. There’s not as much opportunity to blunder in passive, aimless positions, because I’m seeing more. Anyways, I’ve decided to repetitively play through those games. Suggesting moves for each position and comparing to what I did play. Did, I , in review blunder all over again? Experience is now saying; mostly No. but this simple exercise is. I need to Prevent blunders at any speed; and the best way to work on the mental flaws that create them; is to spend up. I’ve been seeing more opportunities, particularly as I’ve dived back into tactics puzzles. The Key is to play whole games like this, rapidly. Blitzing off moves- while really concentrating on not putting out blundering moves that lose material-on-the spot, or allow simple tactics. In the future, of course, more careful and comprehensive efforts are warranted. But the point is I’ve I’m only blundering 1:10 – 1:15. If I were to spend lots of time pergame; slowly working through all the positional aspects doesn’t uncover many blunders and most of them are too silly and easy to really be analyzing them anyways. They need to be written off as candidates at any chess speed. I’ve got to end the noise; of completely botching the melody beyond recognition. And I need to eliminate blunders; such that I don’t need to have tactical “opportunities” to compensate. Music to my ears! Despite the slump (my, indexes are all clear about the existence of one); over at chess.com Most of my slow chess numbers are going very well. I’ve won a couple more Turn-based chess; and delivered victory for team Pittsburgh in their Match vs glassglow. My Turn-based ELO is now around 1650, and IMHO; is probably too high. I can only think that efforts to carefully work out the position on the analysis board, justify the Low Class “B” ELO.... but that itself will pair me up with more talented opposition; and I'm expecting an increase in the analytical ability in some of my games. OTB, though, has gone downhill badly. My only enthusiastic opponent is now a nursing home and has been struggling to stay out of the hospital. There are no LOCAL tournaments that I’m aware of – and I really don’t think I can make the longer drive work. So, I think my skills will simply have to be developed and proven over the internet. Both USCF and FIDE, have now made efforts to standardize and accept Internet play as a form of either blitz or rapid chess strength. Not everyone, will accept, internet credentials. But chess strength is chess strength- if you get high numbers off the internet (without computer assistance) you are in fact a strong player. Ratings are not an ego trip; they are a validation of skill. Not itself important- but reassuring and motivating. but even in this slower time control, recently, blunders have become quite the problem. I'm convinced the solution lies in rapid review with an emphasis on generating legal moves for each position that AREN'T blunders. If I can stop blunders, when I review all these games... I'm half ways to not making them at all.